We have some friends who live a few blocks away who scored the best rental house in the city as far as I’m concerned. In their backyard is three pretty large fruit trees that are producing hundreds of dollars in peaches, plums, and apricots. Luckily, they share and were kind enough to bring me a huge bag of fresh apricots last week. I ate a good number of them as a snack, but when I noticed that a few of them were starting to be over-ripe, I decided to make Apricot BBQ sauce out of them. It was a very good idea that I had. 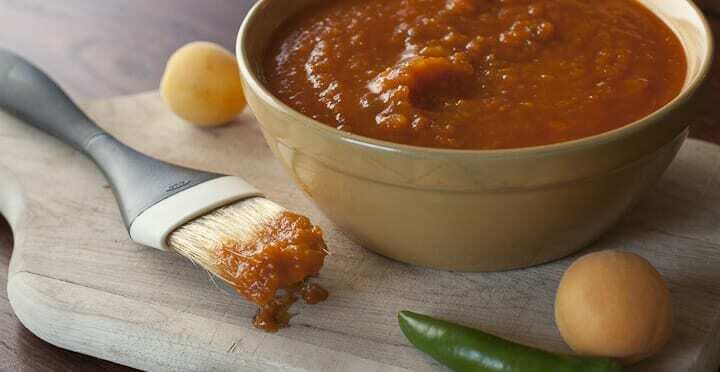 Delicious homemade barbecue sauce made with of fresh ripe apricots and lots of spices. 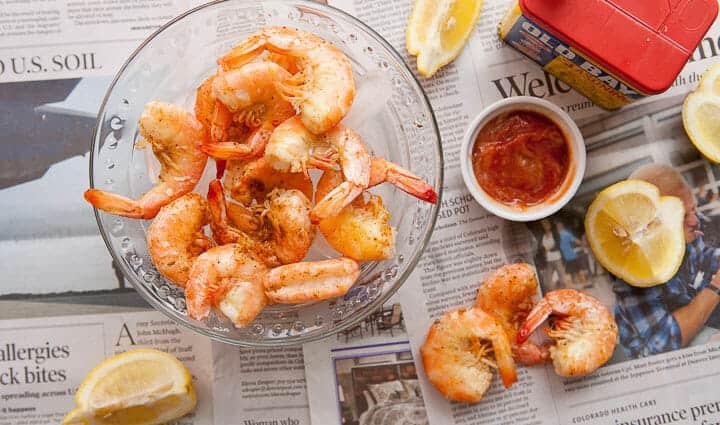 This sauce is perfect for a summer grill out! 1) Add oil to a large pot over medium heat. Once hot, add onions, garlic, Serrano, and ginger. Season with a pinch of salt and cook for a few minutes until onion turns translucent. 2) Add in apricots and cayenne pepper and black pepper. Cook for another minute until fruit starts to soften. 3) Stir in other ingredients and add water last. Stir well to make sure tomato paste is distributed evenly. 4) Bring to a simmer and simmer for 10-15 minutes. Let cool slightly and then blend until mostly smooth, but some chunks are fine. 5) Return to pot and bring back to a simmer. Let simmer for another 45-50 minutes until the mixture is nice and thick. You should be able to find some good looking apricots these days at your market or store, but if you can’t you could just as easily use peaches or maybe even nectarines with this recipe. You would probably want to peel them though. Apricots are super-easy though. All you have to do is slice them in half and pop out their tiny seeds. You can use them just like this. This is an easy sauce to make, but it does require a hour or so of unattended simmering time. It’s important to not rush the sauce so the flavors can deepen and the sauce can thicken. Start it off by adding your oil, garlic, peppers, and ginger to a large pot over medium heat. 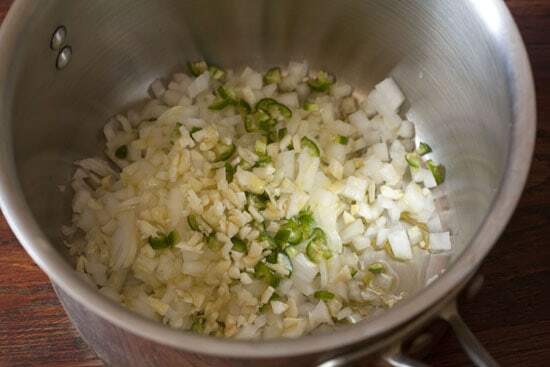 Cook this mixture until the onions start to soften. Give it a pinch of salt and pepper also to start the seasoning process. 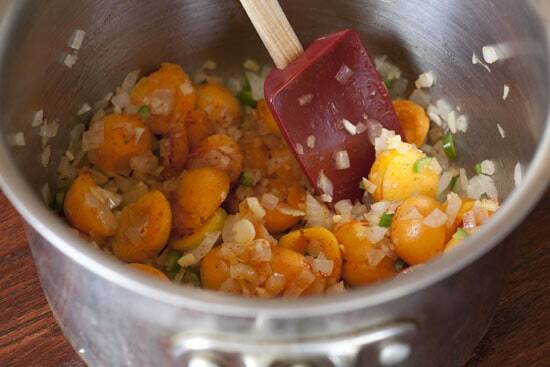 Once the onions are soft, you can toss in your apricots. I roughly used about two cups of apricots, but you could use up to three cups without a problem. 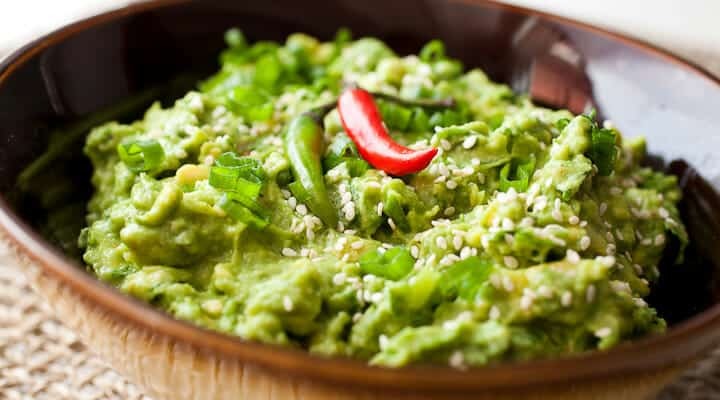 The cayenne gives the sauce a nice kick, but if you are afraid of heat, feel free to leave it out as the Serrano pepper gives it some heat also. 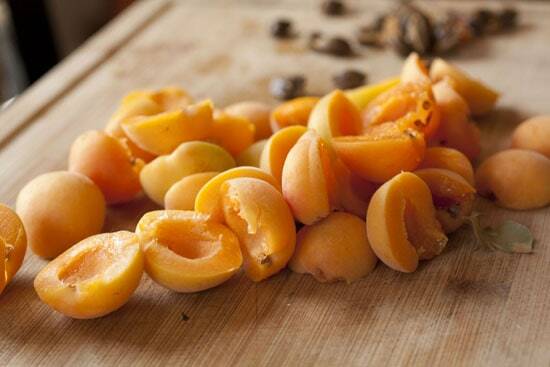 After another minute or two over the heat, the apricots will start to soften. Now it’s time for some liquids. 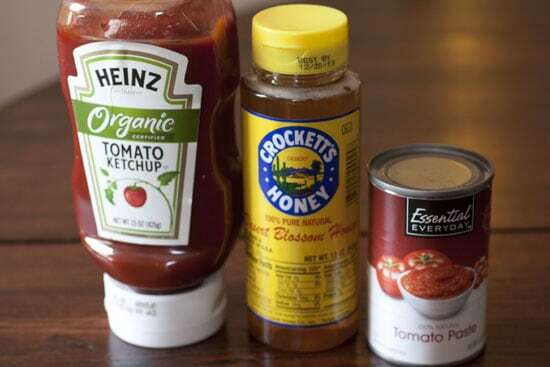 There are four liquids or pastes that I added to my Apricot BBQ sauce sauce besides just water. You don’t need a lot of any one of these, but they all add some complexity to the sauce. The most important one, in my opinion, isn’t pictured below: vinegar. Don’t skimp on the vinegar! It gives the sauce a wonderful tangy flavor. Add all the liquids to the pot along with a few cups of water and bring the mixture to a simmer. Simmer the sauce for 10-15 minutes and all of the veggies and fruit should start to fall apart. At this point, I recommend taking it off the heat, letting it cool for a few minutes, and then blending the sauce until it’s mostly smooth. I used my stick blender for this, but you could use a regular blender also. I highly recommend letting the sauce cool before blending so you don’t fling bits of hot sauce all over your kitchen. Still a bit chunky is okay. 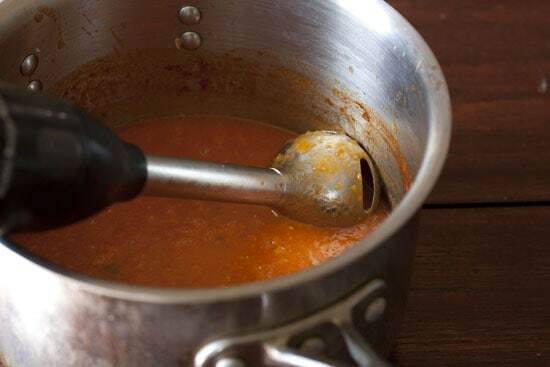 Once the sauce is blended until it’s mostly smooth, return it to a medium heat and bring it back to a simmer. Let it simmer for 45-50 minutes until it’s nice and thick. Give it a stir every 15 minutes or so just to make sure it isn’t burning. Once the sauce has cooked down a bit, taste it for salt and pepper. It’ll probably need a good pinch of both. This Apricot BBQ sauce can go on pretty much anything on the grill. 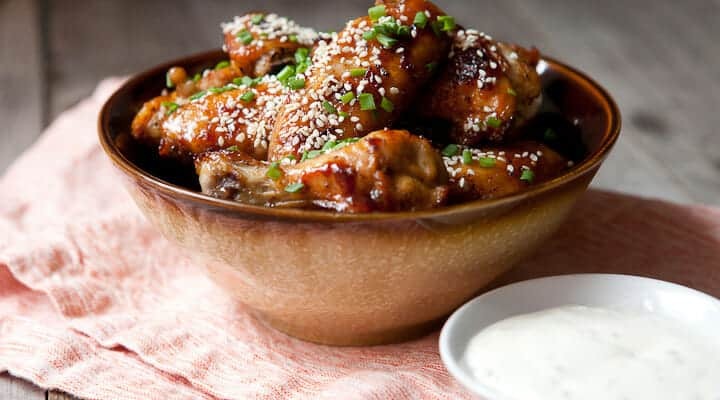 I made some chicken wings one day and tossed them in this sauce. They were delicious. 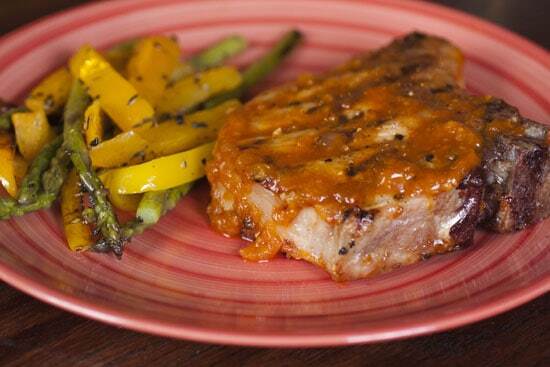 I also grilled some thick bone-in pork chops and slather those in the apricot bbq sauce. That made for an awesome summer dinner. This Apricot BBQ sauce is definitely worth the time it takes, especially because most of the time is basically unattended. It’s just sitting there happily simmering. It’s hard to not love a good homemade barbecue sauce. You just can’t find this kind of thing in the store. Funny! Two Weeks ago I was going to Make Apricot (or Peach) BBQ Sauce with Ketchup, etc. . . But then got the Idea of Peach Mustard BBQ Sauce Pulled Chicken, but only Had Apricots, so used them with the Mustard Base! Topped off with Apple Cabbage Slaw in a wrap. Great Photo’s! Especially the Serrano and Ginger one.. . 2 of My Fav ingredients! How do you store it? And how long does it keep? I have some extra peaches from the CSA. Can this be canned? I have an abundance of apricots and thought this would be great to make for Christmas gifts but I would obviously need to preserve it. I haven’t canned anything so maybe I am getting in too deep. Doing the same old BBQ can get so boring. This recipe is just what I need to kick it up a notch! I can’t wait to try it on tofu. Made this last night, smothered it on a grilled pork tenderloin seasoned only with s&p. Very good! Only mistake i would say was I pureed it too much in the blender and it looked like baby food, I should have pulsed it for a bit chunkier sauce. Nice sauce, Nick. Pork loves apricot. Wonderful! I’m so glad to see that you make your own BBQ sauce! Fab recipe! I guess you made a huge batch? Because there are definitely more than 2 apricots pictured in the pot!!! Looks and sounds fabulous. Hey Mimi, the recipe calls for two cups of apricots… not just two. Probably works out to 8-10 apricots depending on their size. Good luck! I like the way you write, and I like how clear your explanations are. Thanks for the guideline. I’m going in! Awesome! I used this sauce with a pork shoulder, and talk about awesome pulled pork! Dry rubbed the shoulder overnight, then low and slow for 6 hours. Pulled the pork, and then added this wonderful sauce!! Such a balance of sweet, and heat! Will definitely keep this recipe, and will use it many times in the future. My daughter and I made this today and couldn’t stop tasting it! We canned it and added some lime juice to increase the acidity. We will be hoarding our jars.